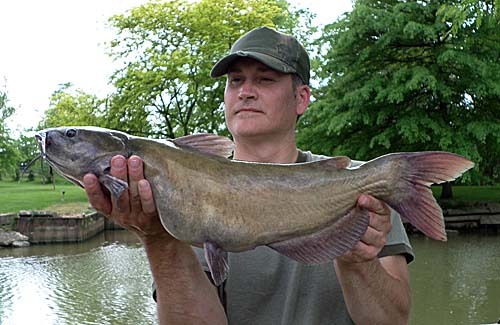 FREMONT, OH – After my trip to Florida, I have only fished a couple of times. Weather has been a bit odd in Ohio this winter with it just cold enough to have ice cover on most bodies of water, but not cold enough to make the ice safe enough. I guess I should say not safe enough for me, some brave souls have ventured onto the ice. 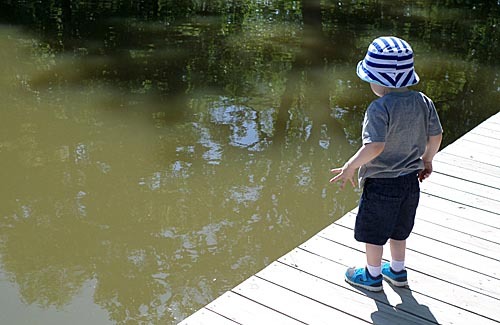 When the water has been open, my four year old and I have targeted panfish in a few ponds, without even a nibble. Steelhead fisherman seem to be having a good year in the NE Ohio tribs, but I simply haven’t had any opportunities to get out after them since the fall. I am hoping that changes. 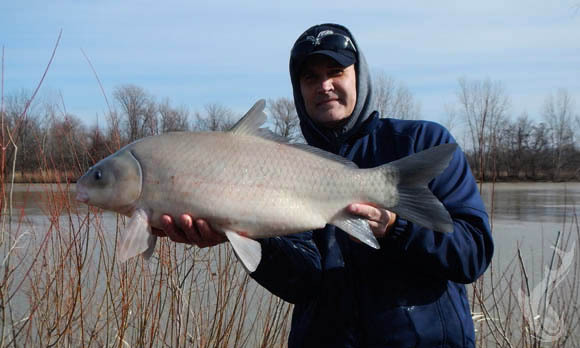 Having longed for the fight of a good sized fish and some responsibilities that put me on the Sandusky River, it was an easy decision to rig up for carp and buffalo. 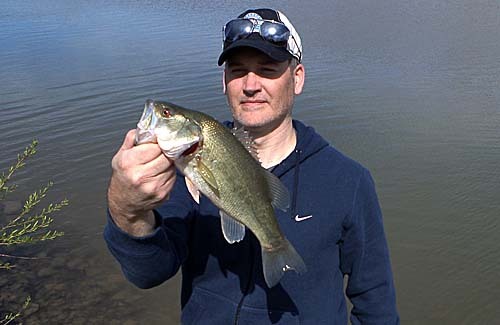 With the water still extremely cold, it is usually a matter of simply having the patience to wait it out for a bite. I have an area that I know well, where opportunistic fish are holding nearly year round, where the current supplies food. At different points in the year, the spot can often get a bite before your rig even settles on the bottom. 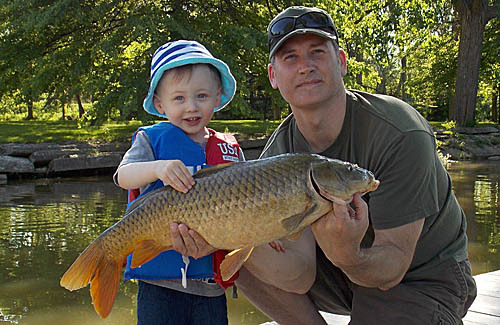 As for this time of year, you just have to have confidence a fish or two is there and the mindset that a day of fishing for a single bite is okay. Fortunately, I had the time and the ability to multi task with a host of things I needed to get done while fishing. While not the exciting fast paced action a lot of anglers seem to need, it suits me fine to wait out a bigger species this time of year. It took 6 hours of fishing, but the effort was worth it when I finally got to hoist a decently large fish in front of the camera. I can’t wait for the water to warm up a bit, where the same time commitment will yield vastly better numbers of fish. 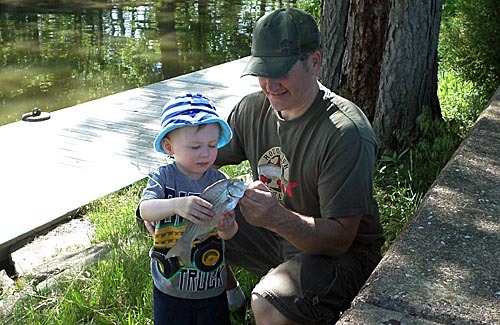 The White Bass Run in the Sandusky River didn’t prove to be that great for me this year. It seems it was one of those years where every time I got to fish, the action just wasn’t fast. I did catch a fair number, but those familiar with the run know exactly how fantastic it can be if you time it right. So I made the most of my outings by simply enjoying the other species that were being cooperative. This turned out to be various ‘rough’ fish, which was plenty fun, and included another Fish Ohio Award. Over the course of several trips during the Memorial Day Weekend, the theme of species was consistent. The White Bass would hit now and then but the majority of catches were Channel Catfish, Freshwater Drum, White Perch, and Common Carp. I did change up my offerings quite a bit, minnows, night- crawlers and threw inline spinners and a few swim baits, but these were the only takers. No complaints, I was catching fish! 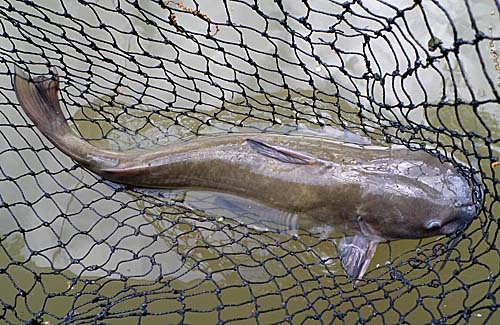 The big catfish was a fun catch. I was using a 1/64 oz. jig tipped with waxworms, under a bobber. I was fishing only about a foot off the dock, in 3 feet of water. The bobber went under with some ferocity and when I lifted the rod it almost yanked out of my hands. So much for me thinking I was targeting panfish on that rod! The drag was set correctly and I was happy the 6# test line held up each time the fish ran. My dad was beside me on the dock and we had a blast trying to get it netted, 4-5 times we got it close and it would take off again. Even when we had it back close to the dock it was doing loops and circles and it was exhausting trying to get the net in front of it. We did finally manage to get it landed, and a few photos later, it was swimming again. Definitely a memorable catch. So there’s my Memorial Day Weekend fishing report. It was great to spend time with the family and feel the tug of a few fish. A big thank you to all active duty and veterans out there. I also am very thankful for all those who gave their lives for the freedoms we have. A trip to my parent’s home today, meant a chance for the family to do some fishing. We were on the Sandusky River, north of Fremont, targeting White Bass with minnows. The action was okay, but quite a bit slower than what I was expecting. In order to generate a few more bites, I opted to use Nightcrawlers on the second rod. I figured two different kinds of bait might get us a few more strikes. This would be especially important to keep Bryce’s attention. 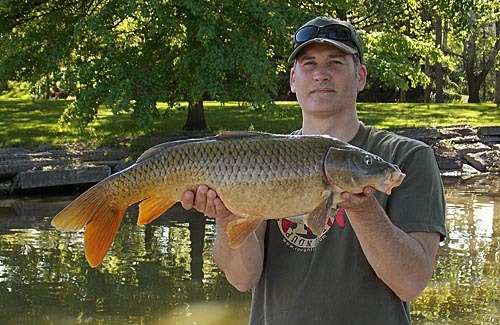 The decision ended up being a good one, as I ended up reeling in a rather large Common Carp. The hard fighting fish took me about 7 minutes to bring in and went 30″ on the tape. It has been quite awhile since I caught a Fish Ohio Award qualifying catch and it was fun that Bryce was right there getting to see and touch (actually hugged) the fish. 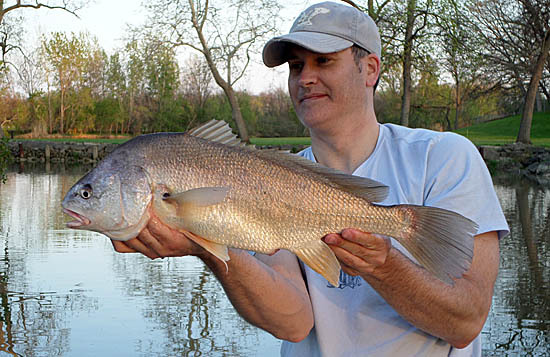 The carp was the showstopper today, but plenty of White Bass, Sheephead and White Perch also were caught by day’s end. Bryce has gotten pretty comfortable around the fish and became increasingly insistent on being able to handle them. Jill did a great job getting some photos of him trying to be patient and taking instruction from me. 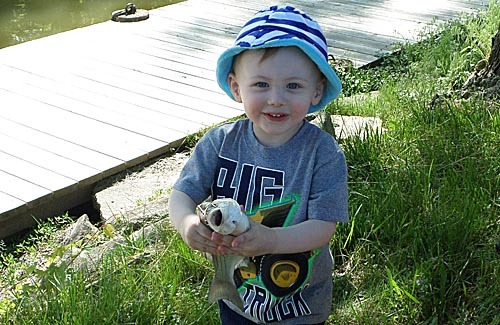 He was very happy to hold a fish on his own and even throw it back in the water for his first ever unassisted catch & release. His form could use some work but at least he enjoyed letting them go. So there you have it, a memorable day with the family on the Sandusky River. I appreciate everyone’s tolerance as I am sure I will post every ‘first’ that Bryce does as it relates to fish and/or fishing. What can I say, I love my boy!, and I know other dad’s understand.